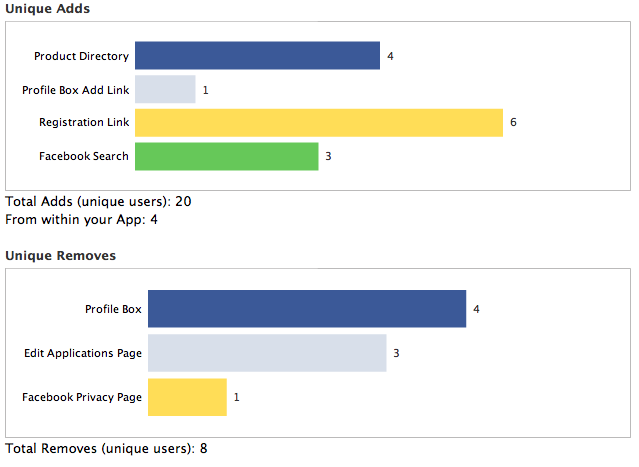 This chart shows the breakdown of how users found and added the application today. So, what amazing features are planned now? None! The app doesn’t have any major bugs and does its job well for the number of users it serves. I don’t think there’s a need for me to continue active development, which is why that actually stopped a number of months ago. Of course, the app is open source and part of AMO’s codebase, so patches are welcome. There are a couple other reasons I’m not too excited about working on Facebook Platform stuff anymore. For one, while it’s pretty easy to get started developing an application for Facebook Platform, it’s now almost a full-time job trying to keep an application up to date utilizing all of the latest bugfixes and improvements, something that only companies dedicated to Facebook App development can handle. There are changes and new features constantly announced in the Platform Status Feed, Developer News Blog, and weekly push SVN commit log. Developers might also find themselves spending time in the platform Bugzilla, forum, or wiki. There are so many sources of information to follow if you want to feel like you’re on top of things. There was a time when I complained about the lack of all of these tools (mainly the open bug tracking system), so I suppose I should be happy they’re here. Rock Your Firefox has been fortunate in that it hasn’t been broken by any of the changes so far — at least not any of the intentional changes. This is a bit longer than it was supposed to be. I’ll probably post another RYF update in 6 months or so. If you haven’t tried out Rock Your Firefox, you can check it out here.